 As we’ve had a lot of people asking about this, we thought we’d take the time to introduce you to some of the places where you can purchase Blue Fridge beers! Of course, we have to start with Luke’s Kitchen. We’ve been on tap here ever since we brewed our first batch of Sweet As. 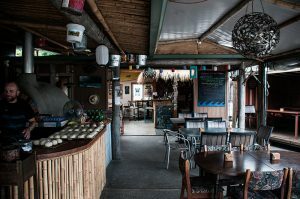 Luke’s Kitchen is in the village of Kuaotunu, just down the road from our brewery in the bush, and it boasts three different Blue Fridge taps. Luke’s is the first place to get any new creations we’ve been working on, and there’s always at least one of our core range on tap. In summer we also keep one of the taps constantly supplied with The Local Ginger, our refreshing non-alcoholic ginger beer -which tastes even better with a dash of rum! Further north in Auckland, at Honey Bear Restaurant, you can try Liebling. 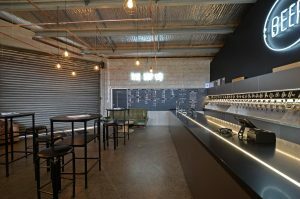 Commissioned for exclusive sale by this new Burmese inspired venue, our special honeyed german wheat beer is only available here, on tap. You can also get a can of Riwakasaurus Rex, if IPAs are more your style. If you’d rather hit the dance floor, Golden Dawn are also stocking our Riwakasaurus Rex cans, and they’re within walking distance so you don’t have to drink & drive between venues! Moving across the bridge, we’re also really pleased that The Beer Spot will feature our beers as part of their constantly rotating 40 taps! Currently they’re pouring Riwakasaurus Rex, but we can’t guarantee they won’t have sold out by the time you get there! Keep an eye on their Facebook page for updates regarding their ever changing selection. We’re working to get into more venues, we know how much you guys love your beer straight from the tap! But, the next best thing is drinking a beer at home, so grab yourself a 6-pack of Riwakasaurus Rex from these local outlets: Puku & Kerres Liquor, Liquorland Whitianga, and Coromandel Liquor. We want to make great beer, and we want you to drink it. We can’t sell directly to the public yet (working on it! ), so if you would like our beers available near you, tell your favourite bar or local liquor outlet to give us a call. Get yourself a beer from the Blue Fridge, and keep chilling. The Team at Blue Fridge Brewery.